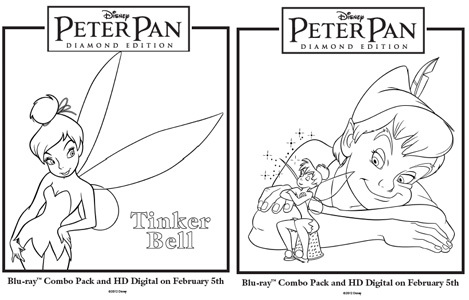 The PETER PAN Diamond Edition Blu Ray/DVD + Digital Copy Combo Pack officially released on Tuesday, February 5, 2013. Based on the Scottish novel by J.M. Barrie, Disney brings to life the story of a mischievous and magical boy who never ages. Peter Pan visits the nursery of three young children in London – Wendy, Michael, and John – and ultimately takes them on an adventure of a lifetime. With pixie dust to help them fly, they venture to Never Land, where they must courageously work together to outsmart the crafty Captain Hook and his comedic sidekick Mr. Smee. If you saw the film as a child (the film originally came out in February 1953), you’re sure to enjoy taking a second look at this brilliant new edition with digitally restored images and plenty of fun bonus features. Want to know where to purchase a copy for your Disney movie collection? Just follow the second star to the north and straight on ’til morning. Or…Buy it on Amazon for $27.99. In the meantime, break out the crayons and let your children get creative with these free Peter Pan Coloring Pages by Disney. Click on the image to download and print from your computer. ABOUT THE AUTHOR: Stephanie Sheaffer is an entrepreneur, writer, runner, and the mother of three little girls. In 2011, she traveled 20,000 miles around the USA with her family in a 300sqft RV. At the end of the trip, her 5-year-old said Disney World was her favorite stop! She now resides in Arizona and blogs at Metropolitan Mama. Follow her on Twitter @stephsday. experienced reading the blog. She noticed several pieces, which included how it is like to possess an incredible giving nature to get certain individuals really easily learn certain complex things. well as easy suggestions about the topic. sean de corral, del de veras. clara, sincera, verdadera y espontánea representación del conjunto del inconsciente y del ánima. and colors with prices starting from Rs. 849 on Myntra online store.